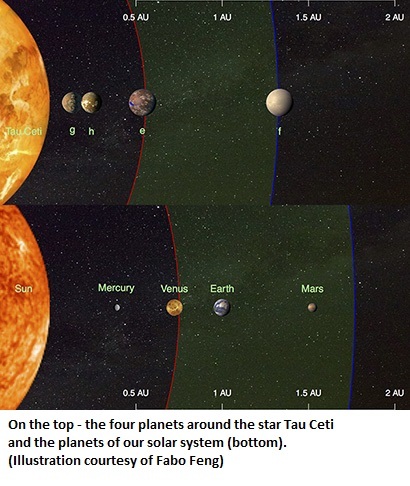 The new study, held by the team of astronomers from UK and USA, has discovered that four Earth-sized planets revolve around the sun-like star Tau Ceti, which is approximately 12 light years distant from Solar System and visible to the unaided eye. Two of the planets are super-Earths. Their mass is as low as 1.7 Earth mass. The orbiting of these Earth-twins in the habitable zone of the Tau Ceti raise the hopes that liquid water and life can exist there. The observations were held by using the High Accuracy Radial Velocity Planet Searcher (HARPS) spectrograph from the European Southern Observatory in Chile, and W. M. Keck Observatory on Maunakea, Hawaii. The new sensitive technique in observing the 30-centimeter-per-second oscillation in the movement of Tau Ceti, that allowed to detect the planets, have been applied. The two planets, supposed to be a habitable place, are surrounded by bulky space debris, intensively bombarding the planets by asteroids and comets. This reduces the chances for life existence. Nevertheless, the astronomers hang tough. They have introduced new methods to distinguish the weak planetary signals, produced by gravitational tugs, from noise in the data, related to stellar surface activity. “We came up with an ingenious way of telling the difference between signals caused by planets and those caused by star’s activity. We realized that we could see how star’s activity differed at different wavelengths and use that information to separate this activity from signals of planets,” said coauthor of research Mikko Tuomi of the University of Hertfordshire, UK.